Adult apterae of the Protaphis terricola species group are dark green with a powdery wax covering (see first picture below). 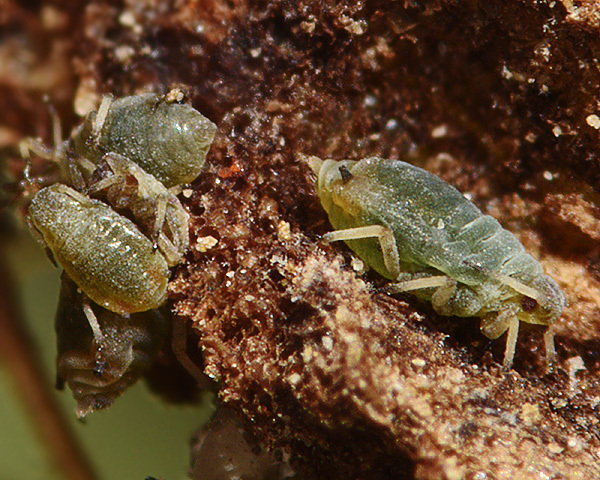 In life they have a reddish suffusion around and between the siphunculi, that can be seen most clearly on the pale green immatures (see second picture below). 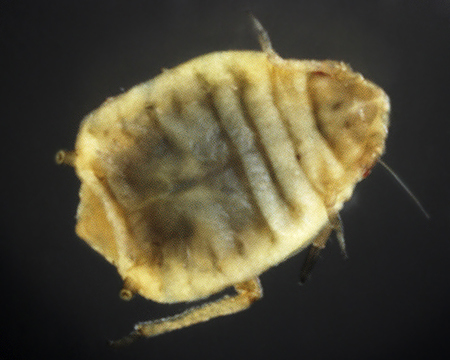 Adult apterae have sclerotized patches on the dorsum on the thoracic segments, and on tergites VI and VII (see micrographs below). The length of the fused last two segments of the rostrum (RIV+V) is 1.2 to 1.4 times as long as the second segment of the hind tarsus (HTII) (cf. Protaphis anuraphoides where RIV+V is 1.45 - 1.65 times the length of HTII). The siphunculi have a weak flange and are 0.67 - 0.92 times the length of the cauda (cf. Protaphis anuraphoides which has siphunculi with a distinct flange and are 0.9 - 1.2 times the caudal length). The adult body length of Protaphis terricola sp. grp. is 1.3-2.0 mm. 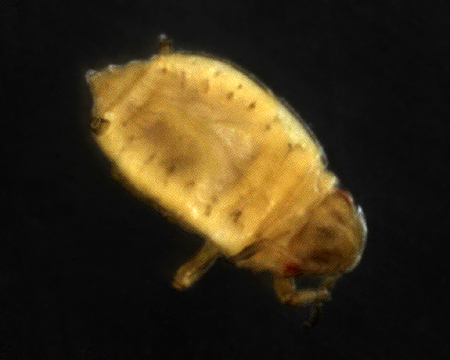 The micrographs below show an adult Protaphis terricola aptera, dorsal and ventral, preserved in ethanol. Blackman & Eastop (2006) note "there are a number of Protaphis species described from Compositae/Asteraceae in Europe, Central Asia and north Africa that cannot be satisfactorily distinguished from terricola". They also note it has not been shown "that the differences are more than the result of local or environmental variation" - hence some species may be synonyms. Protaphis terricola (=Protaphis terricola Rondani =Aphis terricola) may be a polyphagous species feeding on several genera of Composite, or a group of closely related species / subspecies / races feeding on Centaurea, as well as Cirsium, Sonchus and Carlina. 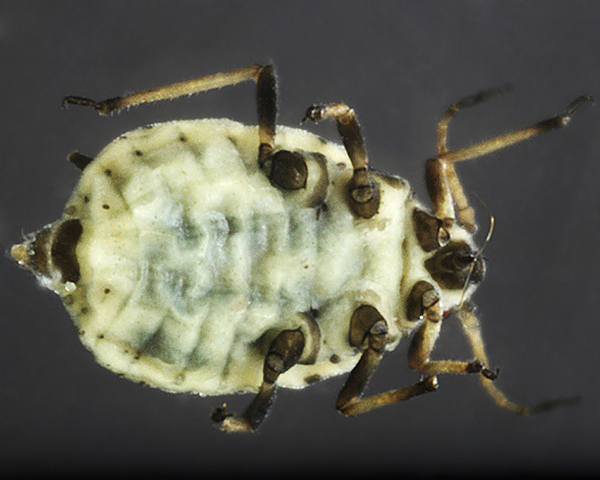 Thus, until the taxonomy is resolved, we refer to this aphid as "Protaphis terricola species group". Protaphis terricola sp. grp. concentrate on the shoot apical meristem of young plants in the ground rosette stage. Later in the year Protaphis terricola sp. grp. have been found feeding on the stem and inflorescences. There is no host alternation. The Protaphis terricola species group has previously been reported from southern, central and eastern Europe, the Middle East, and parts of Asia, and it has been introduced to South America. Our observations are the first and only record of Protaphis terricola sp. grp. in UK to date. 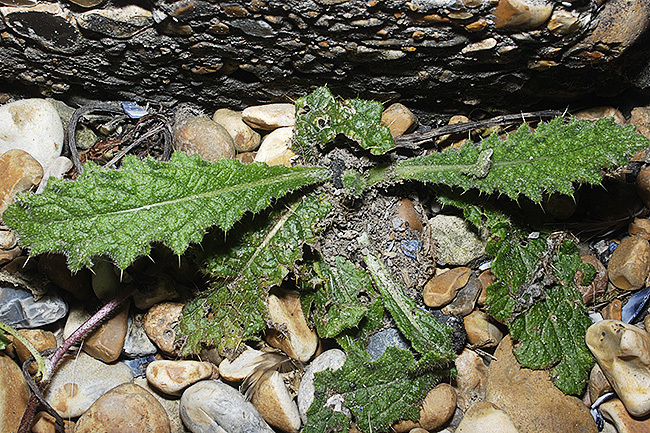 We found several small rosette plants of creeping thistle (Cirsium vulgare) growing on shingle by a concrete path at Rye Harbour Reserve, tented with earth (see picture below). 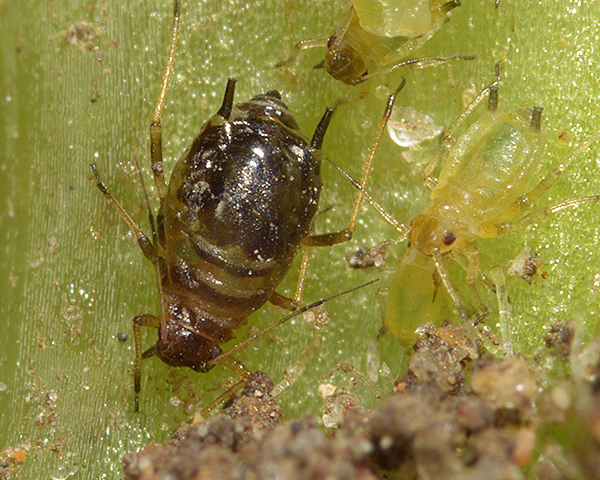 Careful removal of the earth tenting revealed a colony of Protaphis aphids on the shoot apical meristem (growing tip) of the Cirsium plant. Most of the Protaphis found were concentrated at this point, concealed by the leaflets. 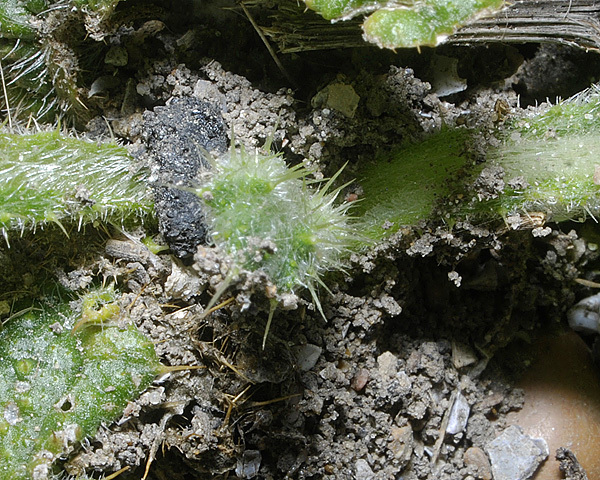 A few were found on other parts of the thistle plant (see below), including the root collar, but these may have moved there when we disturbed the plant during the sampling process. Protaphis terricola sp. grp. seems to be both rare and under-reported owing to its concealed habitat. Alikhani et al. (2010) found Protaphis terricola sp. grp. on thistle (Cirsium) in a survey in central parts of Iran. 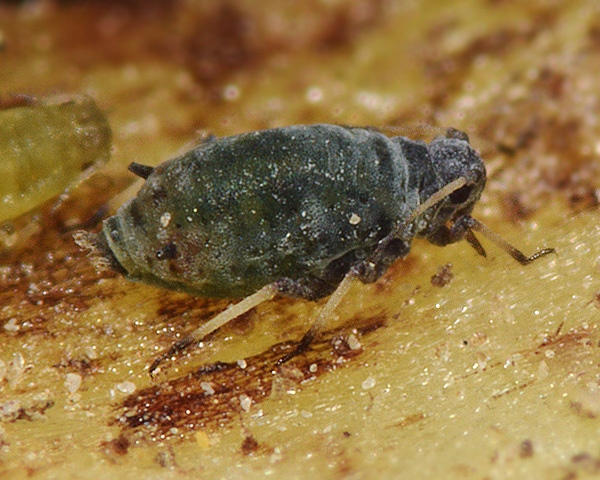 It has recently been reported from lemon orchards in Portugal by Rodrigues et al. 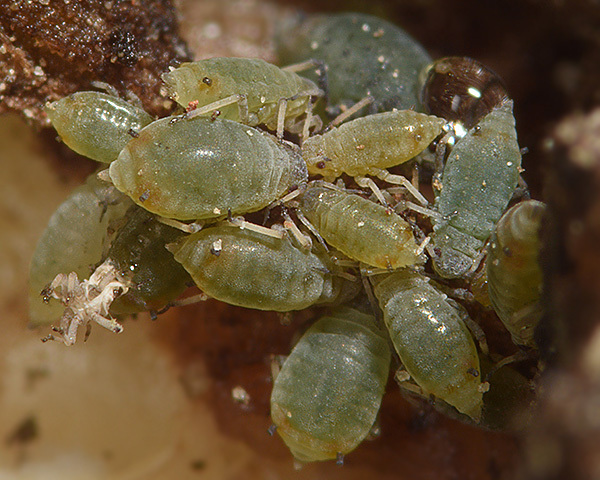 (2006) who found it by suction sampling in ground cover vegetation in lemon orchards in Portugal. 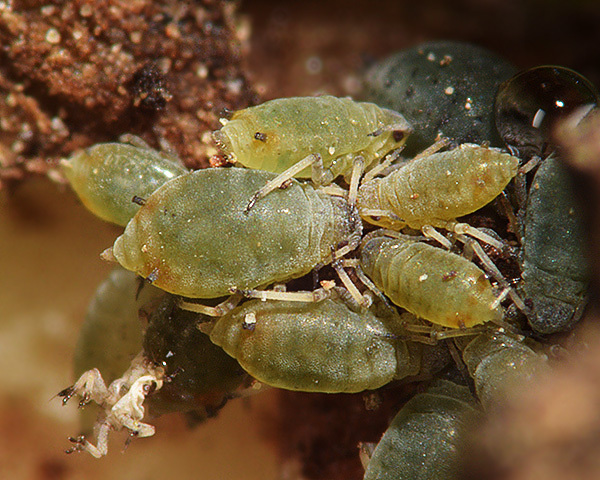 We found populations on the plant at the rosette stage, attended by ants, and tented over with soil or sand particles. The picture below shows the apical meristem of a creeping thistle (Cirsium arvense) with earth particles around it. In this case the ants appeared to have departed, but on another colony the ants were still around. Ozdemir et al. 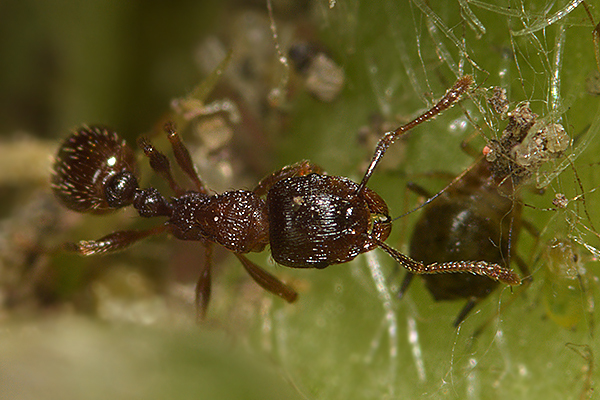 (2008) recorded Lasius turcicus attending Protaphis terricola sp. grp. on Centaurea iberica in Turkey. 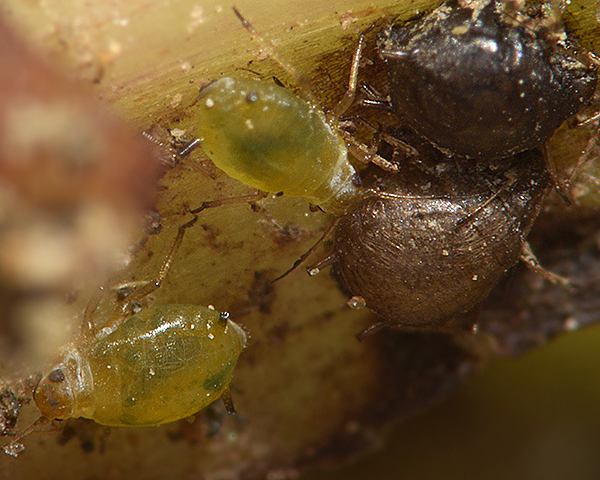 Since we have found these aphids in mixed-species colonies, we do not know which species the ants were attending. 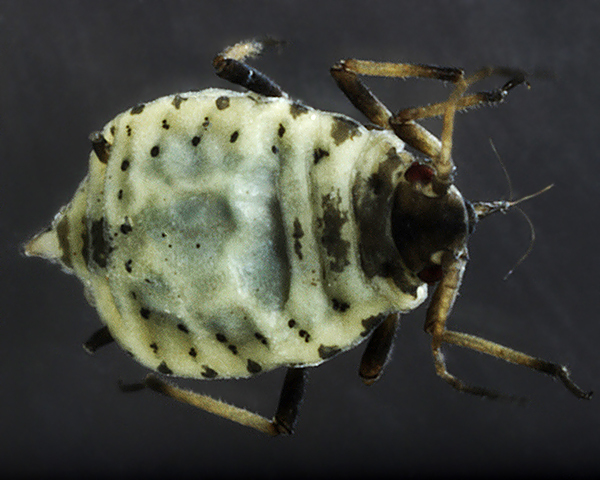 Blackman & Eastop list about 55 species of aphids as feeding on Cirsium species worldwide, and provides formal identification keys for aphids on Cirsium. Of the 27 species on creeping thistle (Cirsium vulgare) Baker (2015) lists 23 as occurring in Britain: Aphis fabae cirsiiacanthoidis, Aphis gossypii, Aphis nasturtii, Aphis solanella, Aulacorthum solani, Brachycaudus cardui, Brachycaudus helichrysi, Brachycaudus lateralis, Capitophorus carduinus, Capitophorus elaeagni, Dysaphis lappae, Dysaphis lappae cirsii, Hyperomyzus lactucae, Macrosiphum euphorbiae, Myzus cymbalariae, Myzus persicae, Protaphis terricola, Protrama radicis, Smynthurodes betae, Trama troglodytes, Uroleucon aeneum, Uroleucon cirsii, Uroleucon jaceae. At Rye Harbour we found Brachycaudus lateralis (see picture below) occupying the same habitat (on Cirsium vulgare) as Protaphis terricola sp. grp. On several occasions they were sharing the same plant. 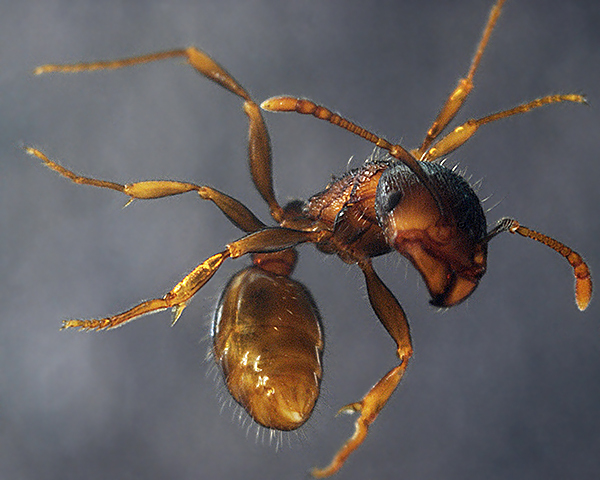 The Brachycaudus lateralis were also attended by ants, apparently a Myrmica species. 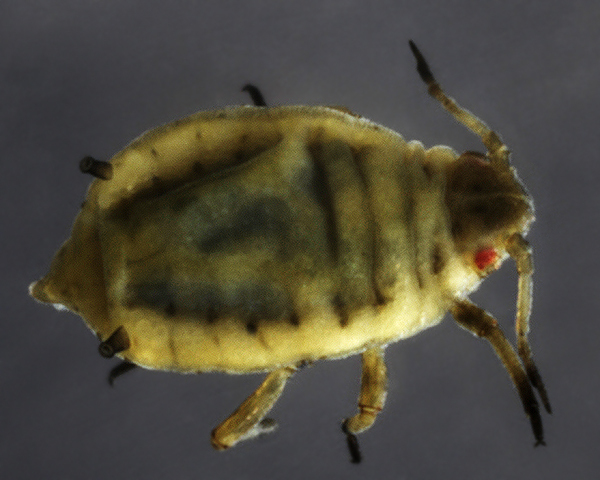 Many of the Brachycaudus had been parasitized by Lysiphlebus fabarum (see picture below showing two immatures and two mummified Brachycaudus). Rakhshani et al. (2013) reported that Protaphis terricola on Anthemis arvensis in Iran was also attacked by the parasitoid Lysiphlebus fabarum, along with other aphids on the collar region, despite the presence of attending ants. We have yet to find any Protaphis that have been parasitized, but it seems likely that the Rye Harbour population is also attacked by Lysiphelebus.